Every now and then you come across a piece of furniture that truly transcends typical design conventions. 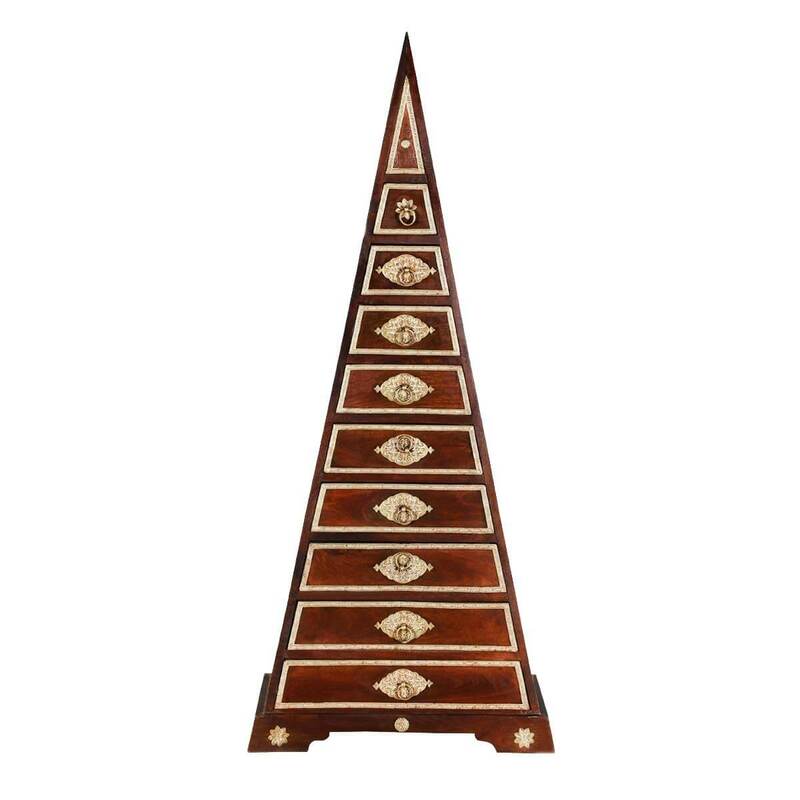 The Tangier Pyramid Mango Wood 9 Drawer Accent Dresser does just that by combining a unique triangle design with remarkable craftsmanship, hammered metal accents, and beautiful wood tones. 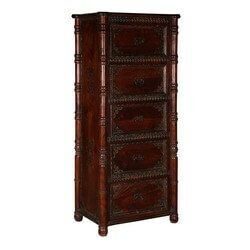 This 100% handcrafted piece begins with Mango wood which is well recognized for its unique and intricate wood grain. At just 25 inches at the base, this accent dresser will fit into tight spaces while providing ample storage with nine drawers. Each drawer is stacked one on top of the other with each drawer becoming smaller and smaller as you go up the tower. 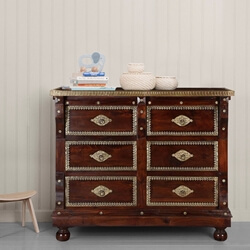 Elegant metalwork, in a gold tone, adorns each drawer with an oval medallion in the center of each drawer face and trim work around each drawer edge. 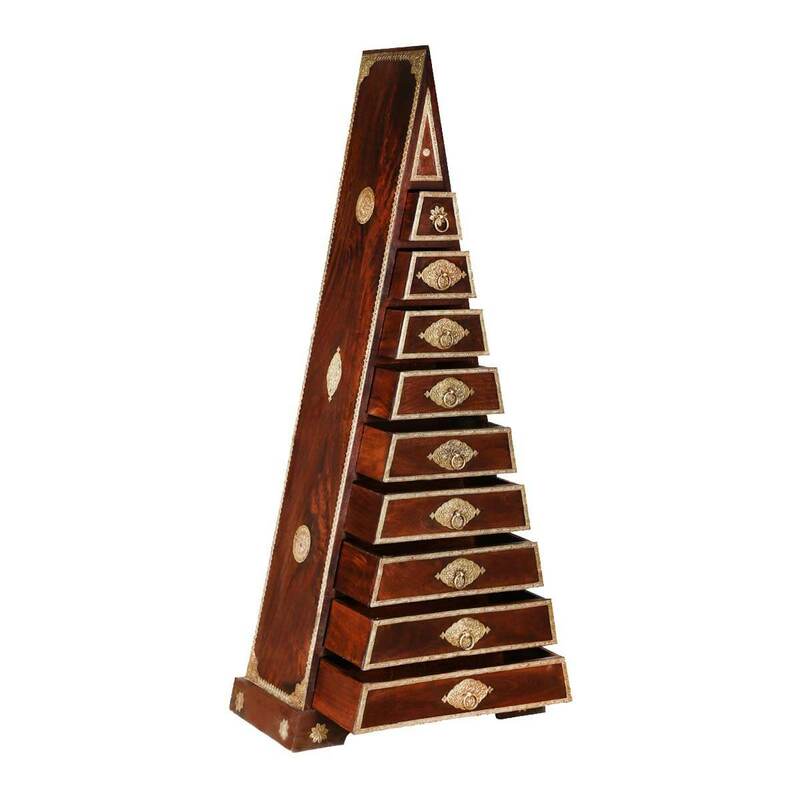 The metalwork continues throughout the cabinet with trim work along the sides of the tower which also feature two circular and one oval medallion. 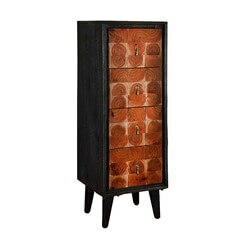 A dark wood finish is hand applied and showcases the unique characteristics of the wooden solids. 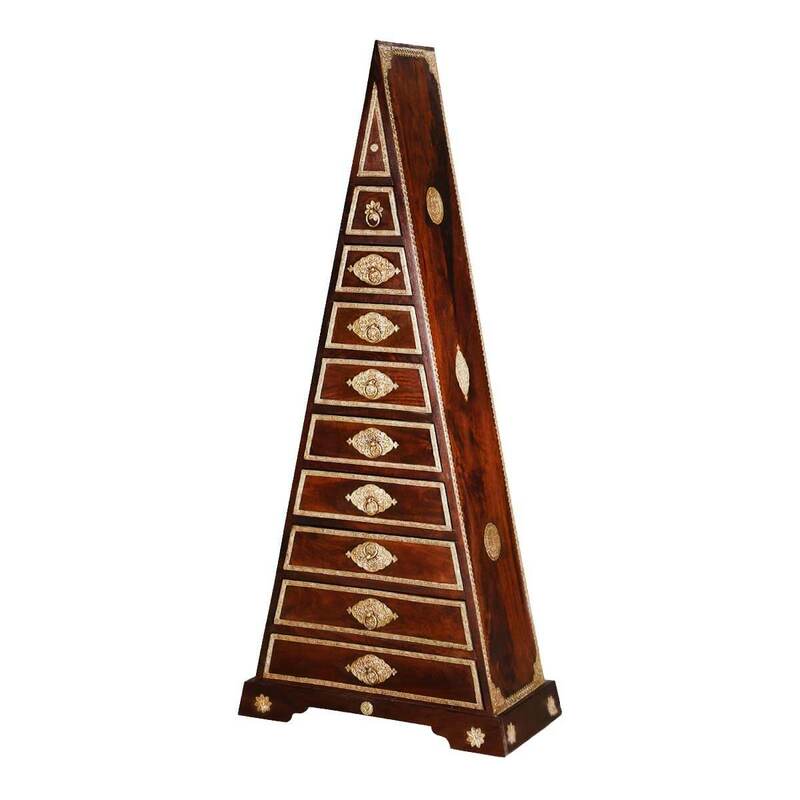 Any bedroom will be instantly upgraded with this unique and brilliant chest of drawers. 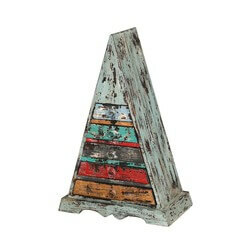 Elegant hammered metal accents and rich wood tones will add sophistication and warmth to any decor. With nine total drawers, you will find ample room for your wardrobe needs along with smaller spaces for those miscellaneous items that are looking for a home. Made of sustainable Mango wood, this accent dresser is strong enough hold up to everyday use while still being light enough to move around easily. 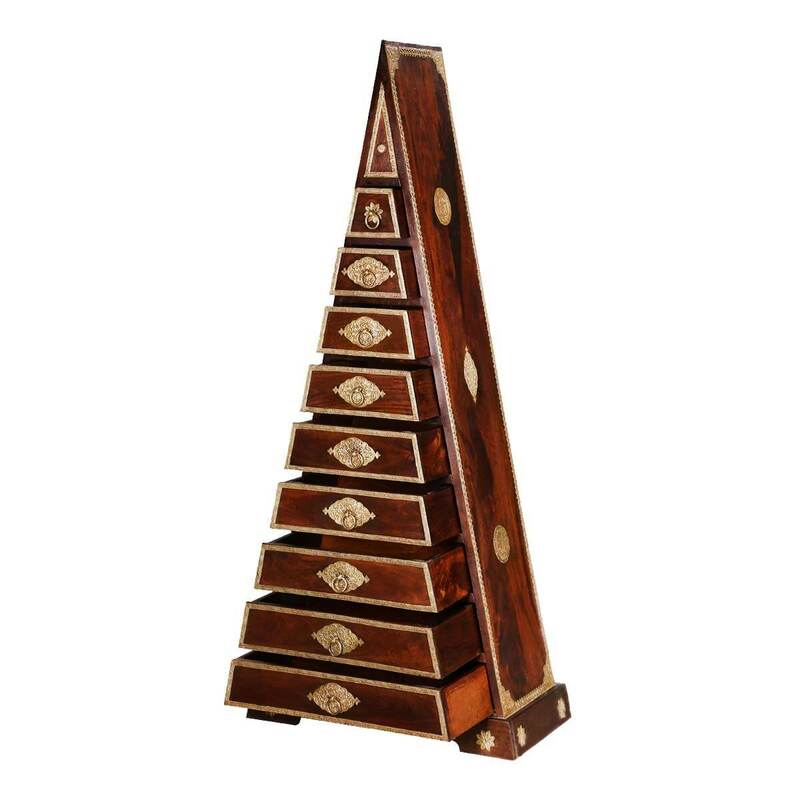 Known for elaborate wood grain and strength, the Mango wood will hold their form and provide a durability and strength that will age gracefully.